Simryn Gill engages with an array of different mediums to explore how we experience place, history and culture in a postcolonial context. 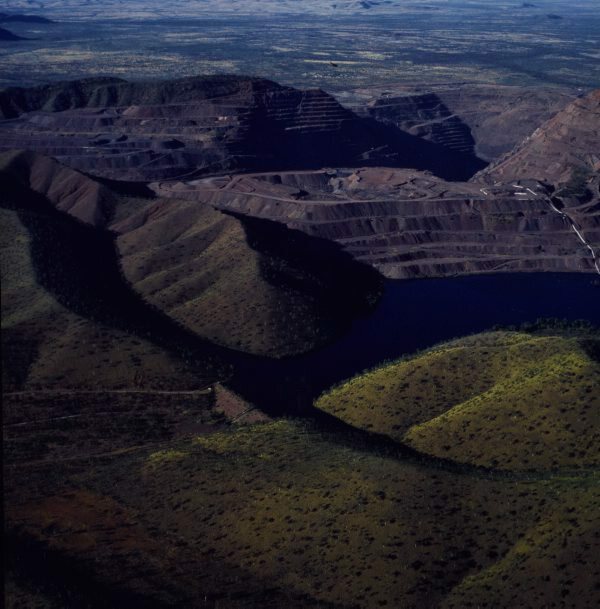 In ‘Eyes and storms’, Gill’s recent group of pictures featuring pit mines, dams, remote lakes and waterholes, the viewer is offered a unique aerial perspective. While the artist has photographed these sites from a light plane hovering way above ground, the images maintain an intimate connection with the land. It is from this elevation that the open pit mines appear as orifices on the surface of the earth, or as the artist alludes to in the work’s title, eyes in the landscape. In keeping with the concerns of her previous work, the photographs bring nature and culture together in a way that assertively shifts the thresholds between the two. The ruinous effects of human intervention into natural processes are evident in the deep striations and faults in formation. In ‘Eyes and storms’ the scars in the landscape are presented not only as a sign of disturbance but also alarming beauty. The work derives from the body of work ‘Here art grows on trees’, which was produced when the artist represented Australia at the 2013 Venice Biennale. Tracing a dialogue between identity and place the photographs, like much of her work, maps the issues of change and displacement in a global context. Here art grows on trees: Simryn Gill , Sydney, 2013, 191. The photograph and Australia , Sydney, Jun 2015, 225 (colour illus. ).